A big shout to Mike and Aradhana of the great Ffynnonofi Farm near Fishguard, Pembrokeshire where we’ve stayed a couple of times in the past. It’s a top place, the sea’s on your doorstep and there’s plenty of countryside to take in as well as some great fruit and veg growing on the farm! Mike’s sent us some snaps of his garden at the present moment and the plants are looking good! 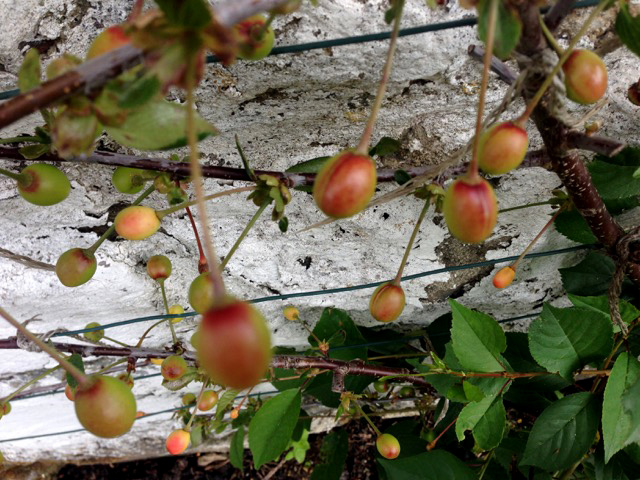 The sweet cherries (above) look brilliant and the plums (below) look like they’re coming on fine too. The morello cherries (below) are starting to turn red. 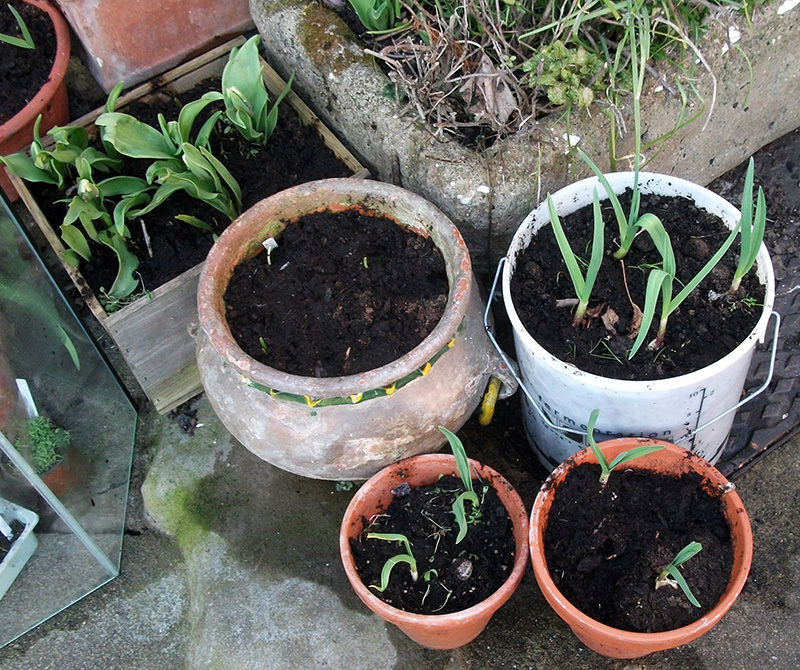 And look at the overwintered garlic below, they went in around november last year and are now well on their way! One of the caretakers of Ffynnonofi Farm is Dai, (the son of the late John Seymour, author of “The new complete book of self-sufficiency” we reviewed on the blog here). His tip is that garlic should ideally go in on the shortest day (usually around the 21st December), and picked on the longest day (around the 21st June). Great advice! Cheers to Mike for sending in the pics and also thanks for passing on this fine classic from Peter Tosh. I’ve got a collection of leggy tomato plants waiting to go in the garden until after the risk of frost has gone, like I have every year. After starting them off on the kitchen windowsill a couple of months ago, I put them in the plastic mini-greenhouse outside with the front open during the day to harden them off. This weekend I stuck one of them under the terrarium outside and also sowed a mixture of seeds beside it. There’s onions and garlic on their way in the bed behind and in the raised bed furthest away have seed potatoes under a good deal of earthed up soil. 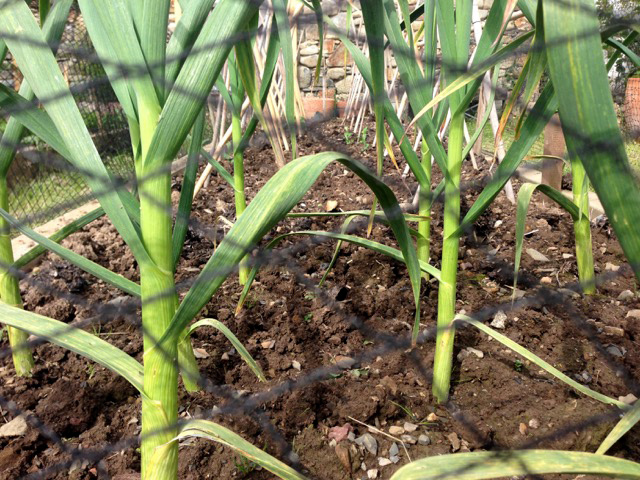 The bed at the bottom of the garden which I was going to keep veg-free this year has now a row of leek seedlings which I sowed indoors on xmas eve last year and a couple of courgette seeds which went in over the weekend under jam jars for extra protection. The rest is a mixture of flowers, a purple sprouting broccoli gone to flower, rocket and strawberries. It won’t be long now until “they’re off” and we can’t wait! I heard two great gardening tips this week. The first was from Penny Golightly (of the great Golightly Gardens website) who mentioned the free tomato seed offer from Heinz. It’s only a limited thing but have a look at their Facebook page here and see if you’re lucky! The reason I was out there was I bought a load of bluebells a fortnight ago which were bought “in the green” (as I missed the proper bulb planting time in the autumn) so when the postlady delivered them on Thursday morning they were live (with roots and shoots and all) so they had to go in. Let’s hope the birds or the squirrels don’t pull them up! 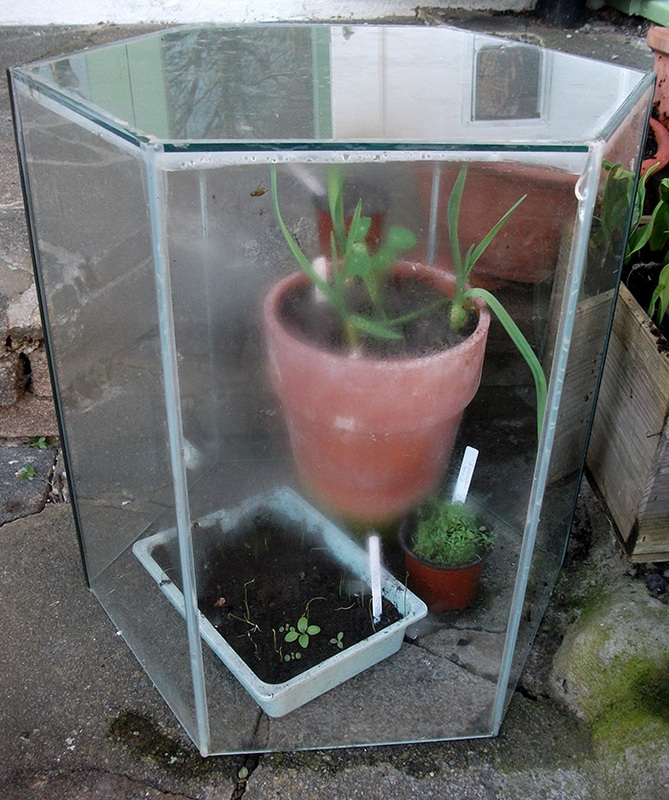 Things are on the move, the onion sets, garlic and parsley under the top half of the old kitchen door are starting to show signs of life and the tomato and pepper seeds I stuck in a few weeks ago indoors are on their way. It won’t be long now, roll on the warm weather! 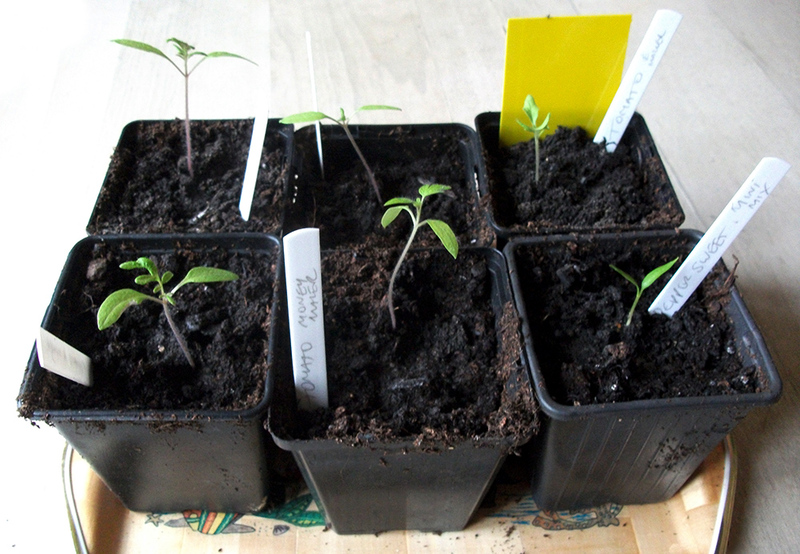 It’s always happens come this time of year, I start to get a bit twitchy and “sow just a few seeds” and come March/April I’ve loads of leggy looking tomato plants sitting on my kitchen windowsill waiting to go out after the risk of frost has gone. Will I ever learn? It certainly don’t look like I will, as just after the new year I went to Shannons and bought some seed compost, a set of seed trays and a plastic propagator. 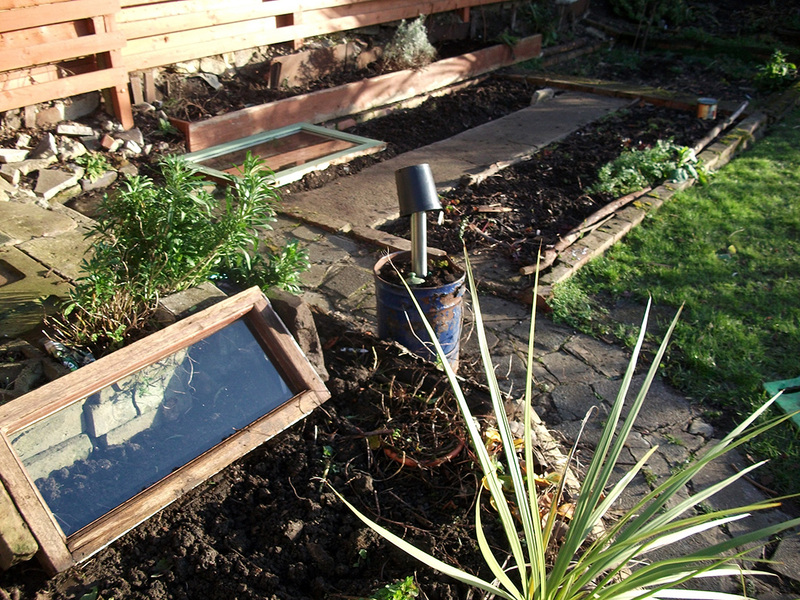 I even had a look at one of those heated propagators with a view to buying one but at £30, had second thoughts. It’s funny I got rid of one on ebay a few years ago as I thought I’d never need it again. Great eh? 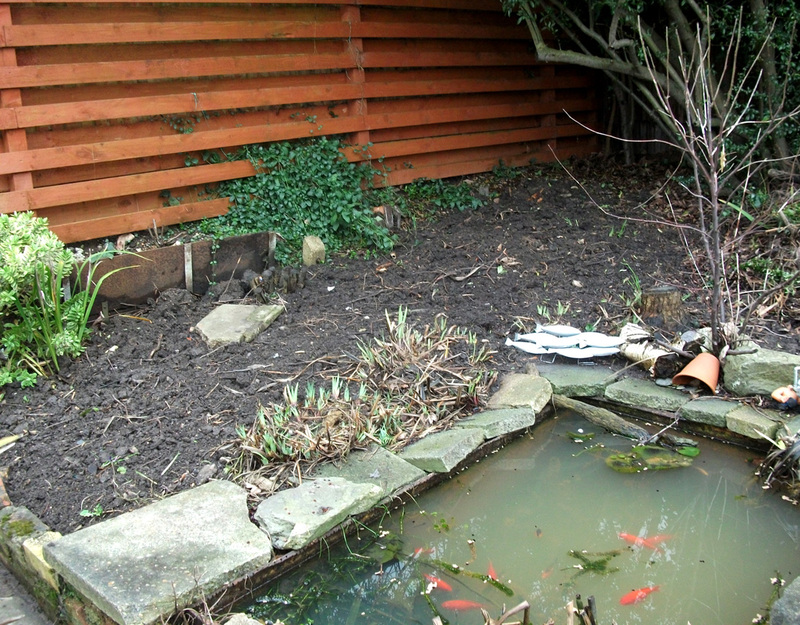 Also over the christmas holidays while off work, I managed to tidy up some of the back garden that got a bit neglected last year. A couple of beds have now been weeded, forked over and now ready for the growing season, giving myself a bit of a head start come spring. I spread some of the great compost that is now starting to come out of the compost bins (albeit with eggshells still in it, I’m now breaking them down more before sticking them in the bin). Also there was a bag of seed onions (Troy) under the stairs that I should have sown in the autumn to be overwintered. Even though I thought I kept them cool and in the dark there’s a few green shoots developing so a few of those went in alongside some cloves of french elephant garlic. 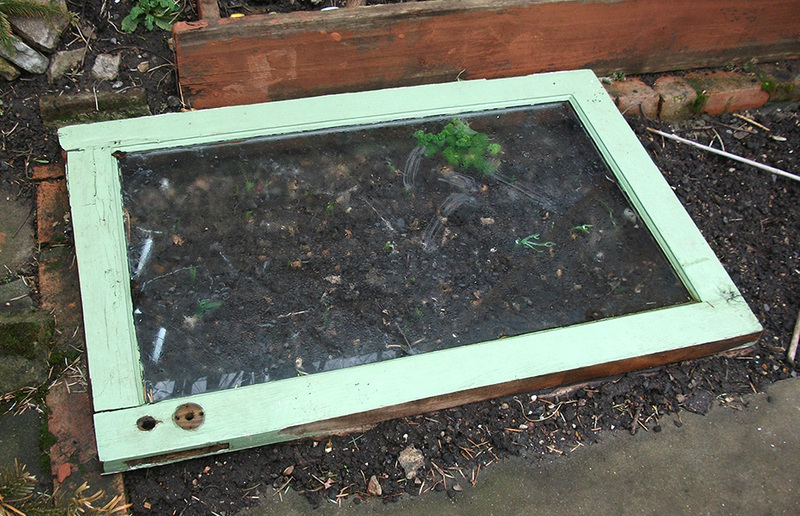 They’ll more then likely rot but “what the eck” they’ve gone in under the old glass frame I found in the street years ago which now doubles as a cold frame once two broken peices of paving slabs go on the ends of it and there’s a few onions under the sawn off glass part of the old kitchen door we had replaced (image above). I mean can you ever be “too early”? We’ll soon see come the spring, if they’ve either rotted or started sprouting! As I write this, the rain is lashing it down like nobodies business. “Twirly?” I do think so! *Full explanation of the term “twirlies” here.